Our little red-eyed friend can drive this vehicle around with his mind. WITH HIS MIND, MAN! This is the product of research into adaptive technologies. The process is pretty invasive, implanting neural electrodes in the motor cortex of the brain. The hope is that some day this will be a safe and reliable prospect for returning mobility to paralysis victims. We found it interesting that the vehicle was trained to react to the rats’ movements. They were allowed to move around a test space under their own power while brain signals were monitored by the electrodes. 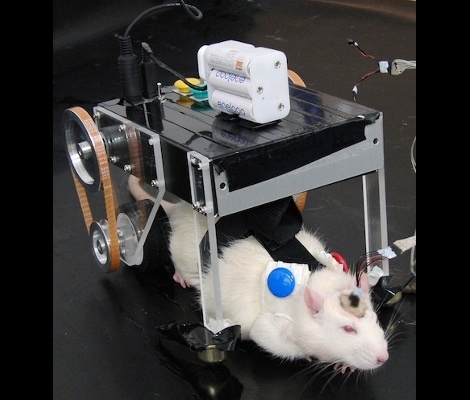 Video tracking was used to correlate their movements with those signals, and that data is used to command the motors for what the Japanese researchers are calling RatCar. We can see the possibilities opening up for a mechanized cockroach v. RatCar free-for-all. Something of a battlebots with a live tilt. But we kid, this is actually quite creepy.